Bus M48 (towards South) immediately in front of the gate, M48 (towards North) across the street. Street crossing for pedestrians regulated by traffic lights. Bus X83 (towards Steglitz) in front of the museum, bus X83 (towards Dahlem) and bus 101 across the street. Street crossing for pedestrians regulated by traffic lights. 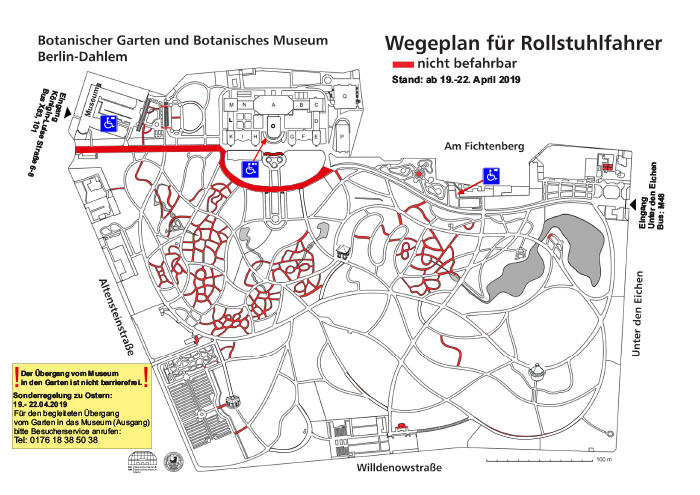 Both entrances Unter den Eichen (=Unter den Eichen 5-10, 12203 Berlin) and the Botanical Museum (= Eingang Königin-Luise-Straße 6-8, 14195 Berlin) are barrier-free garden entrances. Stop for unloading allowed in front of the gate Unter den Eichen. There are no handicapped parking spots. 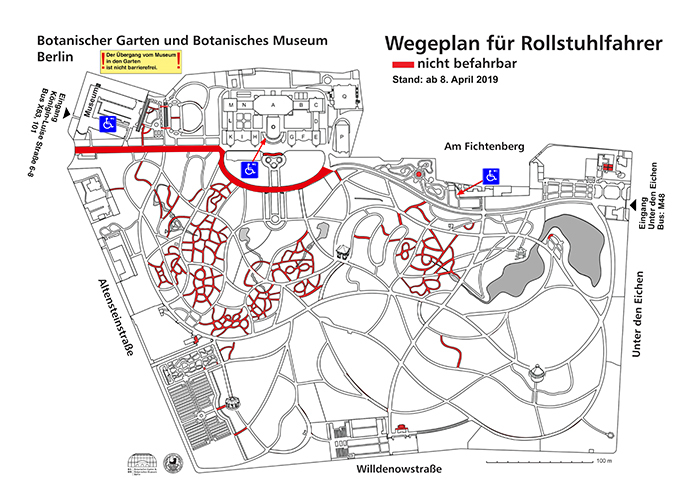 On the grounds of the garden there are 2 barrier-free WCs: at the Duft- u. Tastgarten (Fragrance and Touch Garden) as well as in the Greenhouse (a third is in the Neue Glashaus for special events) - key at cash desk. The Fragrance and Touch Garden is built on elevated beds, within reach of persons sitting in wheel chairs. House P (Plants from the Mediterranean region and the Canary Islands, tree ferns) is accessible by wheelchair. The Mediterranean House accessible by wheelchair. The greenhouse complex has 2 levels (a elevator is available to reach both levels). All greenhouses are accessible by wheelchair with no exception. The museum is accessible (cashier will bring you to the elevator); WC on the ground floor, main hall (key at cash desk). A few wheel chairs are available at the gates for free. For reservation call 030/838-50272 (Entrance Unter den Eichen). A map indicates accessibility: Red marked garden ways are not accessible for wheel chairs. Get your FREE copy at the entrance or as download (below). In general not all of our garden path are barrier-free (garden heritage, mountains). In addition, some ways are not accessible for wheel chairs during constructions. There is no barrier free transfer between the museum and the garden during constructions! We apologize for any inconvenience caused. Thank you for your understanding. Red marked garden ways are not accessible for wheel chairs. Download (pdf-file, printable A4, 2,4 MB).